I spent years (okay, maybe months) looking for a spiced nut recipe. I tried toasting the nuts in oil or butter and spices. Maybe I was doing something wrong, but the seasoning seemed to slide off those slick almonds, leaving greasy, bland nuts. Not what I had in mind. The secret is to use egg whites as the glue to bond the seasonings with the nuts. I start with a base of one egg white, three tablespoons of white sugar, and two teaspoons of salt to season two cups of nuts. Then it’s time to go crazy. Today’s version features vindaloo*, but use what you like — Chinese five-spice, cinnamon, ginger, cloves, cayenne (go easy on that one), ginger, cumin — in combination or on their own. You need to whisk the egg white to break it up, but we’re talking foamy bubbles, not stiff peaks. 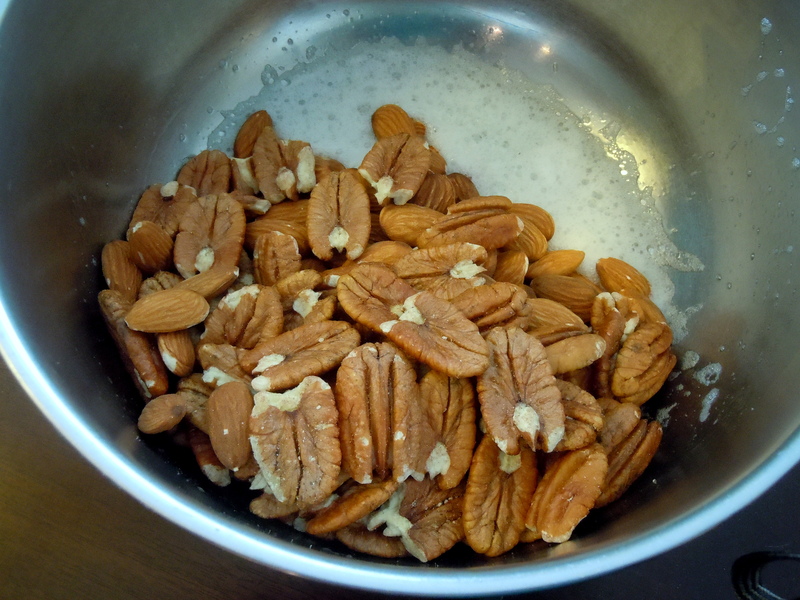 Then dump in the nuts (almonds pecans, hazelnuts — whatever) and stir until the nuts are completely coated in the egg whites. Stir in the seasoning mixture, spread on an oiled cookie sheet, and pop in the oven. Five minutes of prep, 20 minutes in the oven, and you’re done. One do-as-I-say-not-as-I-do tip: After 20 minutes (25 tops), take them out of the oven. They won’t look done at all. They won’t be anything close to crisp. It doesn’t matter. All that crunchiness develops after they cool. The first time I made these, I left them in the oven for close to an hour, waiting for that crunch to appear. By the time I took them out, they were shriveled husks of their former nutty selves. I made them the day before a big summer party once. Humidity levels skyrocketed on party day, and the nuts were a sticky mess. I popped them back in the oven for 5 minutes, and they crisped right up. Let them cool completely on the cookie sheet, but give them a stir now and then. Once they’re at room temperature, they will be crunchy morsels of heaven: slightly salty, slightly sweet, and as spicy as you want them to be. Heat the oven to 325°F. Lightly oil a cookie sheet. In a small bowl, stir together the sugar, salt and spices. In a mixing bowl, whisk the egg white until frothy. Stir in the nuts until every nut is coated in the egg white. Stir in the seasoning until very well combined. Spread the mixture onto the oiled cookie sheet; you want one layer of nuts, not a pile. Roast for 10 minutes; give a good stir and roast for 10 to 15 minutes longer. Cool them on the cookie sheet, stirring occasionally, until there’s no residual heat left and the nuts are crisp. Store them at room temperature. If it’s not humid, you can just set them out in an open bowl. Otherwise, pack them up in a covered container. They’ll last for two weeks, if you hide them. This recipe doubles easily. This entry was posted in appetizers and tagged almonds, egg white, nuts, spice. Bookmark the permalink. You’re making me hungry again! 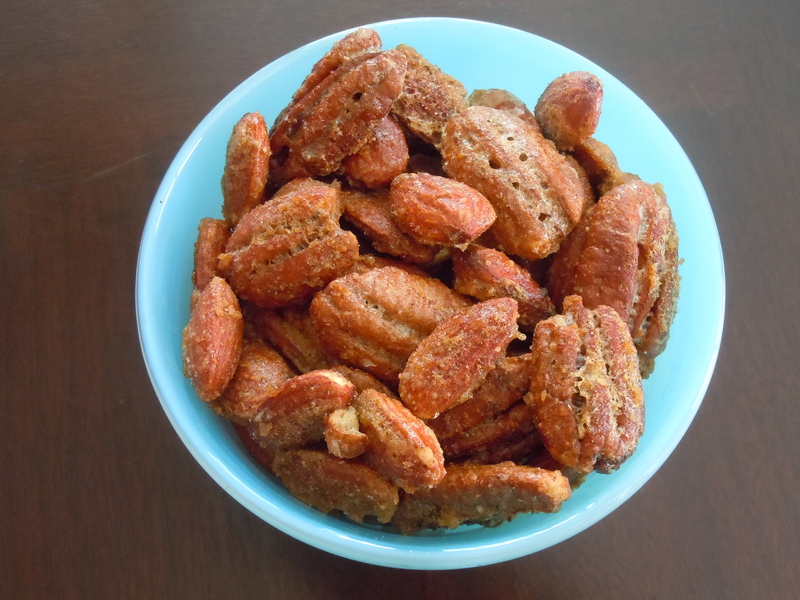 Enjoy — they’re fairly healthy, since the only fat is from the nuts themselves, and there’s only 3 tbs. of sugar for a whole batch. I had them on my cereal this morning. Hey, it’s you! Nice recipe. Thanks. Thanks, Bonni. Glad you liked it.